"You will recognize your own path when you come upon it, because you will suddenly have all the energy and imagination you will ever need. "- Jerry Gillies. I’ve been a lifetime seeker. Its been a long road with a lot of detours, but I feel like I have finally found my so-called “spiritual” path. I did not grow up in a religious home. I was told that we were Lutheran, but my parents were big partiers and drinkers and we never went to church. Although, my dad took me to church once as a child and it felt weird and kind of phony to me. When I was a kid, the only reading material in our home was my dad’s old psychology books from college, and an encyclopedia. I had a voracious appetite for answers. Around the age of 13, I started frequenting the library and read everything from sci fi to non fiction books on anything and everything. I was very much a ‘female nerd’ and still am to this day. My dad had grown up very religious, and it was there in his background but hadn’t really come to the forefront like it did when he retired. As a teenager I used to try to have discussions with him about religion, but when he insisted that he believed in hell, that would frustrate me because it just never made any sense to me, and I’d ultimately walk away in a huff from the discussion. As a teen, I became enraptured with “eastern religions” and loved books such as “Be Here Now” by Baba Ram Das and books by Alan Watts. Also, “Autobiography of a Yogi” was one of my favorites and I took a home study course from the Self Realization Fellowship. Once, I went to an Alan Watts lecture in Los Angeles and the girlfriend I had taken with me walked out on the lecture because he was putting down people who believed in a god up in the sky. I thought she was closed minded. The eastern religions kept me fascinated as a teen, but they were all pretty vague and contradictory, and of course I didn’t have a guru to teach me anything specific. So I still felt like I was seeking. If the Dalai Lama had been around back then, I would have really liked him. At one point, I got initiated into Transcendental Meditation and I practiced that for quite awhile, but life and the problems of becoming an independent adult slowly took over. At the age of 17, I met my husband-to-be and everything began to change. He was very handsome and we met on the beach and he was older than me. He started witnessing to me about Jesus. He took me to a big church that was in a circus tent, Calvary Chapel of Costa Mesa. We would go there in jeans and barefoot with our marked up and highlighted bibles and everyone seemed so blissful when they sang and prayed, so I prayed for salvation with the rest of them. I got baptised at beautiful Corona Del Mar beach and we used to have these great, crowded gatherings there. 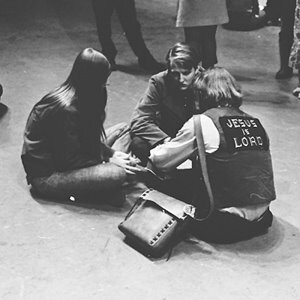 We were “Jesus People” and we were pretty fanatical. I remember witnessing with a group, on a corner to strangers in Belmont Shore and the men would act like they were interested in what I was saying in the hopes that they could pick up on me. I still can’t believe that I actually got up the nerve to witness because I’ve always been pretty shy. Our pastor, Chuck Smith, was a really charismatic, loveable bear of a man. His personality was just too hard to resist. You just had to love him to death. I guess he is the main reason why Calvary Chapel branched out and satellite churches can now be found in most any U.S. town. I learned how to speak in tongues and other “gifts of the spirit” and was also drawn into a more pentacostal church called Shekinah in my own city of Long Beach. Brant Baker was a faith healer, and people would go up to the front at the end of every service and when he touched you, you would fall down on the floor. They had “catchers” who were there specifically to catch you when you fell. I introduced my best girlfriend, Gale, to the church, and she eventually became Brant’s secretary. She told me that she had to answer letters to sad people who wrote in that they really hadn’t been healed like they thought. She said it was very hard to have to think of what to say to them. She later went to work for Trinity Broadcasting company, a Christian television network and married a christian guy, and never worked again. As far as I know, she is still very religious. Brant Baker of Shekinah went on to die from AIDS at a young age, as apparently he was gay. Humanity still finds a way to creep in. At the age of 19, I married the guy who ‘introduced’ me to Jesus and by that time, he was working as the janitor at Calvary Chapel in their brand new sanctuary. We had been engaged for about a year, and in order to get married at Calvary Chapel, you had to get counseling together. I don’t remember much about the counseling sessions except that the Assistant Pastor was angry at me all the time. He thought I wore clothes that were too revealing and he was very upset about that. I always had dressed like a hippie and wore halter tops. Never did we talk about the problem of my husband’s two kids or especially the fact that he couldn’t have any more children – something that later became a problem for me in the marriage. To this day, I still wonder why those important subjects were not broached in favor of lecturing to me about my clothing. We lived in Santa Ana for a few months, and then my husband was saying we had to move to Riverside, because he had become best friends with Greg Laurie, and my husband was hoping to get the new job as Assistant Pastor. Greg’s new church at that time was Calvary Chapel of Riverside, but its now a mega church called Harvest. We lived in the same house as Greg and his new bride, Cathe, which was owned by the church. The men cut the house in half and we lived on the top floor, while Greg and Cathe Laurie lived below us. I could always hear them arguing and especially Greg was upset that Cathe would be in front of a window without enough clothes on. Cathe got pregnant right away and I remember how sad that made me feel, because I couldn’t have children with my husband. While we lived there, a very well known christian man who spoke against cults named Walter Martin of the Christian Research Institute visited Greg, and it was very exciting to know that he was downstairs from us. I did not socialize much at all with Greg and Cathe because I was so very painfully shy. My husband did body work on Greg Laurie’s car and he was always following Greg around like a puppy dog. Finally, Greg told him that he had to hire someone else as Assistant Pastor because the church couldn’t afford my husband’s salary as we were paying child support for my husband’s two kids. My husband was very disappointed, and we moved away, and slowly stopped going to church at all and stopped being so religious. My husband started drinking a lot and he couldn’t have more children, so after ten years of marriage and a major move to Lake Tahoe, my biological clock was ticking and I got a job and divorced him. Fast forward to the age of 40 and I’m a single mom in Reno with an 8 year old daughter and I decide to go back to college. At the same time, I also took a course to become a Hospice volunteer. I’d say it was a combination of both those things, plus a small mid-life crisis, that led to my re-evaluation of where I stood spiritually. Hospice taught me about Tibetan Buddhism and my English lit classes taught me about Carl Jung and Joseph Campbell. I got the internet too, with which I was able to pick up metaphysical and New Age subjects that I could study to my heart’s content. I felt like I was moving forward spiritually, but desperately needed to resolve something from my “Jesus people” days. It was a scripture, and pastor Chuck Smith’s teaching about it. Mark 3:29 - But whoever blasphemes against the Holy Spirit will never be forgiven; he is guilty of an eternal sin. It was a specific sermon that was causing me so much cognitive dissonance. So I found out which sermon it was, and ordered the cassette tape of the sermon. I listened to it and listened to it. I knew that I would be regarded as a “blacksliden” christian by anyone in the church. A backsliden christian was a person who had stopped reading the bible and praying, and was living “in the world.” Chuck Smith taught in this sermon that we can lose our salvation by backsliding. I wished that there was a therapist I could go to, as I felt really stuck and unresolved by this issue. It turns out that the issue of “blaspheming the holy spirit” has all kinds of interpretations to it, and the one I happened to get from my pastor was a very unusual one. Chuck taught that there was no way we could know if we had backsliden enough to lose our salvation, that only god knew. This seemed very unfair to me and it angered me. It certainly didn’t sound like a very fair god, that we would never know if we had lost our salvation or not. I don’t recall what I finally did to resolve my cognitive dissonance over this, but I probably talked to my friends about it and just got over it with time. In the ensuing years, I renewed my old interest in metaphysical and New Age subjects but was not very serious about them. I was still a seeker and wasn’t sure if I believed in god or not. I guess you could say I was a “New Ager” in that I believed in the type of god that Deepak Chopra believes in (an impersonal spirit). All very vague and foggy. I had long ago lost all faith in prayer and in a personal god who cares about us. I discovered books by the Dalai Lama and really liked them. After 30 years in the Tahoe/Reno area, I moved over to Grass Valley, Ca. It was pretty cool to me that the Tibetan monks hung out there in January of every year and I still had a love for Tibetan Buddhism, which is the most intellectual of the Buddhist religions. (They are of the same group as the Dalai Lama). Tibetan Buddhism’s main precept is compassion. I later found out there was a yoga cult nearby in Nevada City called Ananda and felt fortunate that I never became involved in that situation. Apparently their yogi, Kriyananda, was sued by a former female disciple for being sexually involved with her and with other female disciples, and he was expelled from the Self Realization Fellowship. I started attending a Unitarian church once in awhile and continued reading New Age material. My daughter was grown and had driven all the way from Reno to San Francisco to see the Dalai Lama in person once. I had a website called Fundamental Dysfunctions in which I had chronicled every christian friend whom I had lost in my life, merely due to the fact that I was no longer a believer. I placed the website link at Ex-Christian.net and got tons of hits, until my website disappeared when Geocities went out of business. It was at this spot on my path that I stumbled upon the subject of evolution. I watched a documentary on Netflix and didn’t recall learning all that info about evolution in school. I was still hungry for knowledge and for answers, and at last it seemed like there were some concrete answers for me, answers in the natural world. Answers that were not vague and fuzzy and “woo woo,” but answers that I could really sink my teeth into because they had been proven by science and for which there was actual evidence. Understanding evolution was the catalyst for changing my mind. It all made so much sense, for once in my life! At last, all my doubting and questioning of authority had paid off. I was getting into what You Tube has to offer, and I watched debates with Christopher Hitchens, Richard Dawkins, Sam Harris, Daniel Dennett, Michael Shermer, Lawrence Krauss and Dan Barker, among others. I read many of their books. I was finally getting intellectual satisfaction on a very deep level, something I had not experienced before. The fuzzy “New Age” scales started dropping from my eyes. I looked upon my past delving into christianity and eastern spirituality with new understanding and a new perspective. When I suddenly felt shocked that I had actually once believed in what Deepak Chopra teaches, I knew that my perspective had changed radically, in a deeply satisfying way. In the meantime, my father is quickly approaching the age of 80, and like his father before him, has become more and more set in his religious ways. Preaching when he is drunk is no longer funny or a joke, it is very sad. My dad is very much into biblical prophecy (Hal Lindsey). I cannot argue with him anymore. He is too far gone into substance abuse and delusions, very sadly. He says I am demon possessed and am going to hell. I don’t talk to him much anymore as he lives 400 miles away, but when I do, he always asks, “Who am I talking to?” (He means that he isn’t talking to his daughter, but a demon). He has supposedly done exorcisms on me over the phone (I know, it’s very depressing). I can’t hope any more that he wakes up, as watching television evangelists is his daily life and he is old and suffering from alcohol dementia. He had a degree in psychology and philosophy once, which he has completely turned against and thrown away in favor of religion. He won’t let me visit him. I love him very much, but I will not be able to visit my dad before he dies. People have told me that I should lie to him and say that I came back to Jesus, but he is still smart underneath it all and he wouldn’t believe that for a second. This brings me up to the present day. I continue to watch the debates and read the books and I rejoice in the wonders of science and our universe. (I love the site, topdocumentaryfilms.com). I am very happy and at peace within myself on a deep level – something I never felt before even during the depths of prayer or in meditation. I don’t have that gnawing feeling in my gut any more, like I am constantly searching for something, and I am very content with the fact that no one person or church or sect knows the truth. Learning is my great passion in life, at the age of 57. Like Richard Dawkins, I consider myself an agnostic-atheist because no one can disprove a god, but like Lawrence Krauss, I think it’s beautiful that a god is not needed for the universe to exist. I know for sure that there is no personal god. To many people, that is a hopeless thought, but not to me. I enjoy the personal responsibility that comes with knowing that the universe doesn’t care what we do. It is mind blowing to think that billions of people choose to believe in a “bronze age peasant” who existed before we even knew that the planets revolve around the sun and that the earth is not flat. I think that religion is the scourge of mankind and hope dearly that some day we shall pull ourselves out of the new dark ages. I have found my path, and it is more exciting and wondrous and energizing every day!